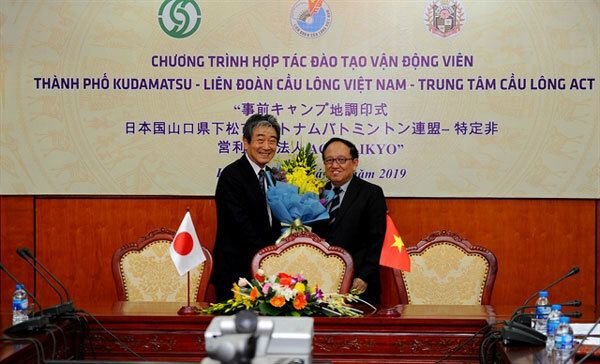 The Viet Nam Badminton Federation has signed a agreement with city of Kudamatsu in Japan and ACT Saikyo Badminton Centre in that city to train its players for the 2020 Tokyo Olympics. “This will strengthen the good relations between Vietnam and Japan in the sports field … and in general,” Le Dang Xu, chairman of the federation, said. Also present at the signing ceremony were representatives of the National Sports Administration and VBF; Kunii Masuo, the mayor of Kudamatsu; Nakamura Takayuki, the president of the Kudamatsu city council; and Japan’s ambassador to Vietnam, Kunio Umeda.